The 15th is fun for a couple of reasons each month. One is that it’s the release of the new Dirty Dozen Gallery at Splitcoaststampers. I love spending time looking thru the new gallery and reading about the newest member(s) to the design team at Splitcoast. The other is that it’s the release of the new stamp set at PaperTrey Ink! After getting sneak peeks for five days prior to the release at Nichole’s blog, I’m always really excited for the newest stamp set link to go live so I can view all the images in the stamp set! Nichole has also been running a contest for a Guest Star Stamper and the reveal for the winner is something else I have looked forward to the past couple of months! I’m excited to be counted among the Honorable Mention list again! I really enjoy creating with the PaperTrey images! I made this card with a particular person in mind. *wink* I wanted to thank Taylor for her help with being my Make-n-Take helper at StampMania, letting me borrow stamps, and for the AWESOME door prize created by her that I won at StampMania. Mmmmm! Mmmmm! This is a one layer card, which I really don’t do very often. This is a sheet of WW cardstock cut at 4 1/4 and scored at 5 1/2 for this top folding card. I had the general idea for how I wanted the focal image to be, and just went from there. I used my VersaMagic inks that I got from eP, in Night Sky and Tea Leaves. I am seriously in love with these inks! They are fabulous for use with clear stamps, as the ink adheres to them really well. I started by stamping the layer for the butterfly from the Butterfly Kisses set on cardstock weight vellum from SU! then set it aside to dry. Next I punched the circle out of WW with my Marvy Mega Circle Punch, applied some Dotto removeable adhesive to the back and placed it on the card as desired. I then placed the dotted line from the Faux Ribbon set on my acrylic block and inked it up with the two colors. Because the inks are a “dew drop” shape, it makes it very easy to do selective inking on your images. The “butterfly trail” was then stamped on the card. Next I inked up and stamped the butterfly base, taking care to have it overlap from the focal image to the card base. Then I removed the punched circle and set aside. Next I just stamped a couple of ribbons, again using the Faux Ribbons set, along the bottom of the card. I also learned that I really need to get one of those acrylic blocks with the grid marks on them. It would have made the project so much easier for me! Instead I was placing the acrylic block on my SU! grid paper, and looking thru that to line up the stamps for the faux ribbons. For the kindness faux twill tape, I simply inked up the word “kindness” from the sentiment I was going to use and stamped it on top of the green stripe. The butterfly and flower stripe was created using those images from the Butterfly Kisses set. I then inked up the two sizes of butterflies and stamped them around the butterfly trail to complete the card base. For the focal image, I stamped the sentiment from the Faux Ribbon set, using my VersaMagic inks to selectively ink up the words. Then I stamped the flowers from Green Thumb and set aside. I used my Marvy Giga Scallop Circle punch for the Night of Navy matt, pierced each scallop and highlighted them with my white gel pen. To me, the highlighted scallops are a “Taylor trademark”, so I really wanted to use this on a card made for her. I then adhered the matt to the focal image and drew in the flower stems with my Old Olive marker. The focal image was adhered with Dimensionals and some bling was added for the flower centers. The last touch for the card was to add the vellum butterfly. I used my scallop scissors and carefully cut the shape of the butterfly. It’s very hard to see in the photo, but I made sure to stop around the head of the butterfly so that I could cut the antennea, using straight edge scissors. I then folded the wings up and adhered the butterfly with Mono Multi. The finishing touch was adding Stickles to the butterfly and the butterfly trail. I really liked how the Stickles made the vellum butterfly dry. It gave a lot of dimension to the focal image! Ummmmm, that was a lot of typing for this post! Hahahaha! I hope I didn’t put you to sleep! I am looking forward to receiving the new PaperTrey set! I made sure to place my order right away, since I love bug images! I also ordered some of the white paper Nichole was raving about, and can’t wait to test it out! This is gorgeous…I saw it earlier today and just was stunned! I SAW YOUR CARD AT NICOLE’S BLOG AND JUST HAD COME OVER AND LET YOU KNOW HOW MUCH I ADORE IT! GREAT JOB!!! I love this card so much, it will probably be cased a million and one times by everyone who loves Papertrey! I can’t wait to get the next set either…ordered mine at like 9:30pm pacific time! Congrats on the honorable mention! I saw this on Nichole’s blog and just LOVED it! Absolutely gorgeous! This card is gorgeous, Emily! I loved the colors, two-toned butterfly trail & vellum butterfly. And the patterns you created at the bottom are awesome! Congrats on your honorable mention! Did I say cool, bestest colors, love…. Ooooh! I saw this on Nichole’s blog. No offense to the other fab entries, but this was my personal fave. I love your colors and how crisp everything looks with the white card. 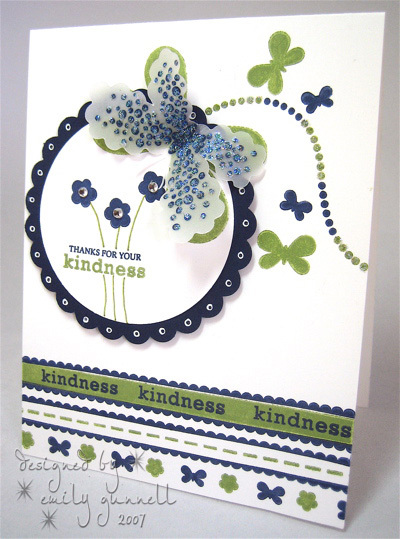 Perfect for this springy, flower, butterfly card. Oh yeah, the scalloped butterfly…so stinkin’ cool. I agree…this was the winner!!! I will be the million and 2 to case it! LOL! You’re blog is so going into my favs. I love when I come across an amazing blog! Gorgeous card. I love your work. This is one of the most beautiful cards I have seen with this set! Fabulous job! Oh Emily, this is so gorgeous. You do such awesome work!! This is to DIE for. Absolutely gorgeous! This is absolutely gorgeous! I can attest to it’s beauty in person as well! *wink* It’s a winner in my book and will remain on my shelf to gaze upon for many days to come! 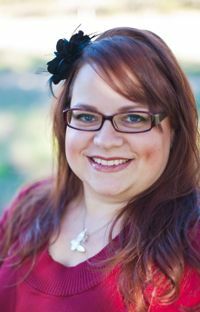 Congrats for the mention on Nicole’s blog! This card is absolutley gorgeous!!! This card is just fabulous–the layout, details, colors–EVERYTHING! I don’t have this set, but it sure is inspiring me to buy it! Beautimous Emily! I love it! I’ve been checking in at your blog for a while now and i keep seeing this card, it’s beautiful! It makes me want that set! Thanks for sharing! I’ve just started my own blog, i’d love it if you’d check it out!